Donald Trump must have felt a little more than shafted when he was left hanging by a top figure in Poland when he went in for a handshake on his latest trip to Europe – but at least this time it wasn’t Joe Biden playing the creep and getting all handsy. After previously having his hand swatted away by Melania on his first trip as President across the ocean, Trump was left in another clumsy predicament again, thanks to Poland’s Agata Kornhauser-Duda. 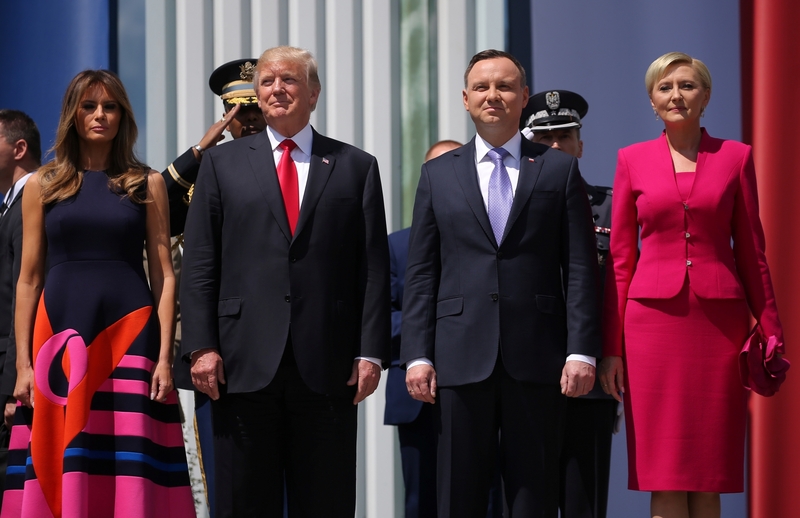 Donald and Melania were front and center on stage with their Polish counterparts, Agata and her husband, President Andrzej Duda, in Warsaw where the official meeting photos were snapped. All good, right? But when it was time to shake hands and smile and look as if they all respect one another, Kornhauser-Duda skipped over Trump’s hand and went to Melania. As a result, the President was left looking somewhat awkward as a frown slowly spread across his face. The Polish First Lady did shake hands with Donald, but only after she had made contact with Melania, but it didn’t stop people responding to what looked like an intentional snub on social media. Earlier, the President used a joint press conference to beat against the American media, before acknowledging that Russia interfered in the 2016 election. I really do hope that Trump will just ignore the media and put the Twitter down…but I’m afraid I’d be waiting a long time.